Le DC-2 ex-KLM "PH-AKJ" "Jan Van Gent". Il passera à la Luftwaffe avec le code PC+EC puis à la Lufthansa avec le code D-AJAW. The DC-2 ex-KLM "PH-AKJ" "Jan Van Gent". It will be transferred in the Luftwaffe with the code PC+EC and then in the Lufthansa with the code D-AJAW. Le DC-2 "D-AIAV", avion personnel du général Friedrich Christiansen (code NA+LA). L'avion sera perdu près de Bielefeld le 9 août 1940. 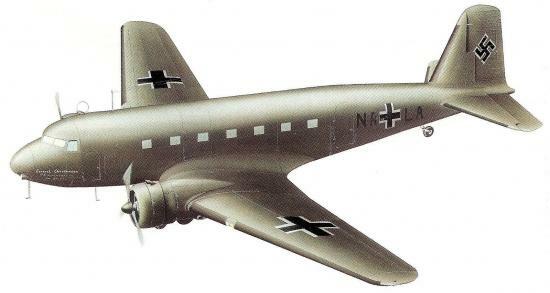 The DC-2 "D-AIAV", personal aircraft of the general Friedrich Christiansen (code NA+LA). The aircraft will be lost near Bielefeld on August 9th, 1940. Ex PH-AKT "Toekan" (de la KLM) du général Friedrich Christiansen, Pays-Bas, Juillet 1940. Accidenté en août 1940 comme D-AIAV (Lufthansa). Ex PH-AKT "Toekan" (of the KLM) of general Friedrich Christiansen, Netherlands, July 1940. Bumped in august 1940 as D-AIAV (Lufthansa).